Sergio Rodriguez, closing of the 1968 Summer Olympic Games at the Estadio Olímpico Universitario, 1968, Mexico City, Mexico. Courtesy of the artist. MÉXICO 68 reanimates the Mexico City’s epic 1968 Olympic Games through a series of artist projects presented in public space that question the currency of the urban and cultural infrastructure left behind by the ambitious world event. 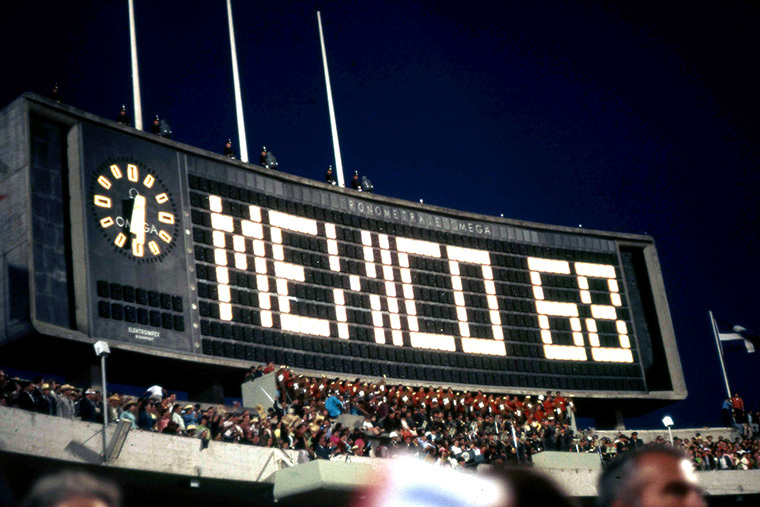 Taking place in the wake of the controversial 2016 Summer Olympics in Rio de Janeiro, Brazil, the projects commissioned by MÉXICO 68 trace a direct line between the complex period of contentious social, political, and cultural activity in Mexico during 1968 with contemporary Brazil—a country that is currently undergoing dramatic changes in the light of the upcoming games. Using Olympic landmarks throughout Mexico City as the stage for this city-wide series of exhibitions, MÉXICO 68 researches, analyzes, and questions the impact that events of this scale leave in a city's socioeconomic and cultural imaginary. José Esparza Chong Cuy works with architecture through exhibitions, events, and printed matter. His work connects architectural practice with contemporary world events to situate architecture within a larger social, economic, and political discourse. He is the Pamela Alper Associate Curator at the Museum of Contemporary Art in Chicago. Esparza received an MS in critical, curatorial and conceptual practices in architecture from Columbia University in 2012, and is a former curatorial associate at the Storefront for Art and Architecture in New York. During his time in New York, he also held a research fellowship position at the New Museum of Contemporary Art and served as the New York correspondent for Domus magazine. In 2012 he traveled between Mexico City and Lisbon, holding positions as contributing editor at Domus and as curator of the 2013 Lisbon Architecture Triennial. From 2013 until 2016, he was associate curator at Museo Jumex in Mexico City. Guillermo Ruiz de Teresa is an architect and urbanist whose research focuses on the intersection of space, state, and power. Ruiz de Teresa trained as an architect and urban planner at the Universidad Iberoamericana and the Architectural Association in London. He received a master’s in design studies at Harvard University’s Graduate School of Design in 2013. He previously founded Pase Usted, a nonprofit organization focused on the power of citizens to transform the urban environment, and Tomo, an independent contemporary culture magazine published from 2009 through 2013. He has collaborated extensively with cultural institutions across the Americas, including the Museo Tamayo, the Colección Patricia Phelps de Cisneros, and the Storefront for Art and Architecture, among many others. He is currently based in Mexico City where he works at the crossroads of governance and citizen engagement.